In this performance, Isaac “Tsunye” Rymer combines two distinct lyrical Yiddish love songs. The first two verses are a song beginning with the line Tsum ban vil ikh nit geyn [I don’t want to go to the train] and the third and fourth verses are a different song that begins with the line – Ven ikh volt geven a foygele [If I were a bird]. Whether he learned the songs this way or combined them himself is unknown. Rymer says he learned this in Bessarabia on the way to America. It took him and his wife 4 years to arrive in the US once they left their town in the Ukraine. Tsunye Rymer at the Sholem Aleichem Cultural Center, Bronx, NYC, 1980s. From right: Jacob Gorelik, Dr. Jonas Gottesman, Tsunye Rymer. Recently singer Inna Barmash recorded a song, accompanied by violist Ljova (Lev Zhurbin) with these motifs from the Beregovski/Slobin collection on her CD Yiddish Love Songs and Lullabies (2013). Why the combination of songs? The singer (if not Rymer, then the one he learned it from?) perhaps added the third and fourth verses to add a little hopefulness and not end the song on such a bleak note. oy tsim ban vel ikh nit geyn. un ikh vel blaybn af der platforme shteyn. un ikh vel blaybn af der ploshchatke shteyn. un tsum dritn mul iz shoyn nishtu keyn mentsh. Ikh hob nit pospeyet di hant im derlangen. Di ban iz shoyn avek fin undz gants vayt. Di ban iz shoyn avek fun undz gants vayt. volt ikh tsu dir gefloygn. oyf mayne farveynte oygn – oyf mayne farveynte oygn. volt ikh tsu dir geshvumen. un du volst tsu mir gekumen. Oy to the train I will not go. To the train I will not go. and I will remain standing on the platform. I did not even manage to give him my hand. The train had gone by then quite far. I would fly to you. I would swim to you. and you would then come to me. This one-verse song ‘Mir af a shifl, dir af a lotke’ (“A Boat for Me, a Canoe for You”) was performed by Zelig Schnadover, and recorded by Itzik Gottesman in Mexico City, 1988. Curiously, the first line from this ditty appears under the boat in the above 1960s painting of the Israeli artist Arie Aroch (1908-1974), who spent his childhood in Kharkov (Kharkiv), Ukraine. Zelig Schnadover was born in 1907 in Slavuta [Yiddish – Slavite סלאַוויטע ] Ukraine. In 1920 they “escaped the Bolsheviks” and the family went to Poland. He had his bar-mitsve in Brody, [Yiddish – Brod], Poland. He lived in Poland until 1926 and learned the song there. Schnadover emigrated to Mexico City in 1926/27. To make money in the early years in Mexico City Schnadover was part of a group of singers who provided the soundtrack to silent movies, many of them Russian, so they sang Russian songs. They didn’t have much time to prepare – usually they had not seen the movie earlier so amusing things happened. An example he gave was for Abel Gance’s film Napoleon. The group was still singing a waltz as the projector was already showing a battle scene. When I knew him he had been the longtime owner of a stationary store, a papeleria, near the center of the city, the Zocolo. You – one with tuberculosis. After the initial posting, musicologist Dmitri “Zisl” Slepovitch pointed out a connection to a song he had recorded from Sterna Gorodetskaya in Mahilyow (Mogilev), Belarus, which was posted earlier to the Yiddish Song of the Week. 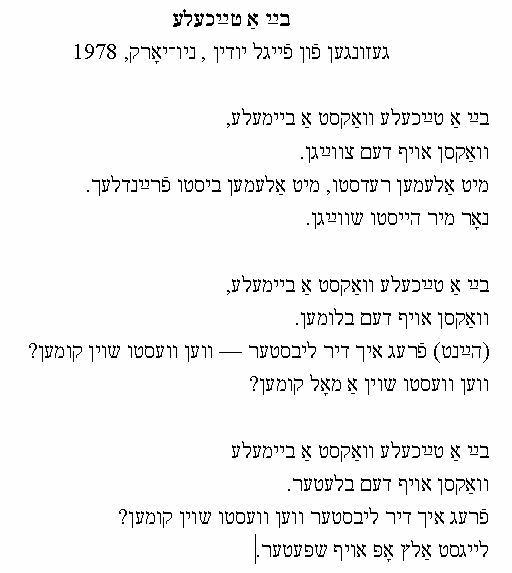 Also, a variant of the song from Brest-Litovsk (Yiddish – Brisk, now in Belarus) appears in I. L. Cahan’s 1912 collection with no music but with a second verse and presents it as a dialogue. The first verse sung by “He”, the second one by “She”. You – a [female] soldier. You – a girl with tuberculosis. Special thanks for help with this week’s posting goes to Tamara Gleason Freidberg, Paul Glasser and Rachel Greene.